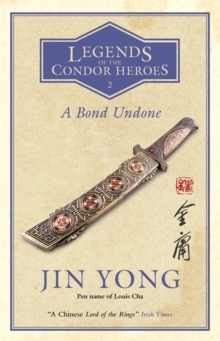 THE CHINESE "LORD OF THE RINGS" - NOW IN ENGLISH FOR THE FIRST TIME. THE SERIES EVERY CHINESE READER HAS BEEN ENJOYING FOR DECADES - 100 MILLION COPIES SOLD. In the Jin capital of Zhongdu, Guo Jing learns the truth of his father's death and finds he is now betrothed, against his will, to two women. Neither of them is his sweetheart Lotus Huang. Torn between following his heart and fulfilling his filial duty, he journeys through the country of his parents with Lotus, encountering mysterious martial heroes and becoming drawn into the struggle for the supreme martial text, the Nine Yin Manual. But his past is catching up with him. The widow of an evil man he accidentally killed as a child has tracked him down, intent on revenge. Meanwhile, his true parentage at last revealed, Yang Kang, the young prince Guo Jing must face in the Garden of the Eight Drunken Immortals, is forced to choose his destiny.